Potholes occur on roads everywhere. It probably doesn’t come as a surprise to learn that across the United States, drivers are collectively spending around $3 billion dollars a year to repair damage to their cars that has been caused by potholes. Repairs can range from minor tire damage to more serious suspension problems, but colliding with a pothole can also cause a driver to lose control of their vehicle and this can lead to accidents. Were you injured from a pothole accident? Reach out to our auto accident attorneys in Tulsa at The Edwards Law Firm. We can help you get the compensation you deserve for your injuries. Contact us today for a free case assessment. 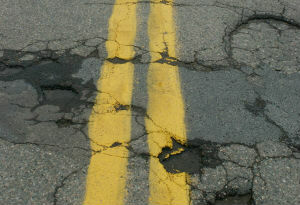 Potholes are most often caused over time. Any weakness or deficiency in the pavement that is not repaired and sealed can allow moisture into the cracks, which will compromise the strength of the road. This can be especially problematic in areas prone to repeated freezing and thawing during the winter months. The arrival of spring weather can reveal roads that have begun to crumble underneath the surface and this kind of damage can create large, unavoidable potholes which, if not repaired and maintained, will only get worse over time. The maintenance of potholes is the responsibility of state and local governments, but the prevalence and costliness of this issue makes it difficult for them to keep up with repairs. Drivers must stay alert or they risk not only costly repairs but serious accidents caused by themselves or other drivers when the impact made with a pothole is jarring enough that they lose control of their car. The experienced car accident attorneys at the Edwards Law Firm have seen the damage that can occur in these kinds of accidents. They advise drivers to be aware of the amount of space between their vehicle and the one in front of them on roads where potholes are a known problem and to allow enough room to identify and steer around dangerous areas when possible. If you have been involved in an accident caused by conditions similar to the ones detailed here, we can help. Contact us today for a free case evaluation and let us use our years of experience to help you identify your legal options.